Not all soaps are created equal. Did you know, for example, that so-called "cleansing" soaps can actually be the most damaging to your skin? Or that certain "old-fashioned" soaps have properties far superior to that of higher-priced brands? Soaps can vary significantly, both in terms of their chemical makeup and the clinical effects they have on your skin. By knowing what to look for you can find the bar soap best suited to your individual skin care needs. Traditional soaps have long been made by mixing oils (animal fats or vegetable oils) and liquid (most often water) with an alkali. The alkali works on the oils and triggers a chemical process called saponification. Saponification is the act of turning oils, liquid, and alkali into soap. For making bar soap the alkali used is sodium hydroxide, also known as lye. Although this sounds harsh (who wants to wash with lye?) there is no lye left in properly made soap. All of the ingredients have been converted into soap. Historically, soap was made with tallow (beef fat) or lard (pork fat). Soap makers today still make soap in the same manner, except modern soaps are more likely to contain coconut oil, palm oil, olive oil, and other specialty fruit, nut, and/or vegetable oils than animal fats. Manufacturers also add fragrance, colors, essential oils, herbs, and other ingredients to add the product's appeal, although many of these add-ins do little in the way of contributing to good skin health. Only soap made in the traditional way, comprised of alkali salts of fatty acids (in more basic terms, oils that have been saponified with an alkali) is considered a "true" soap. True soap can be found today, made by large manufacturers to small artisan crafters alike. True bar soaps contain surfactants that reduce surface tension between oil and water. Surfactants certainly do the best job of capturing dirt and washing it away. It was previously thought that true soaps left the skin's pH unbalanced since soap is slightly alkaline with an average pH of eight to nine. Human skin is naturally slightly acidic, with a pH of around four and a half to five and a half. Most research done today shows that, even after cleansing with soap, the skin reverts back to its normal pH very quickly. So having a pH balanced bar isn't really as important as what was previously believed. 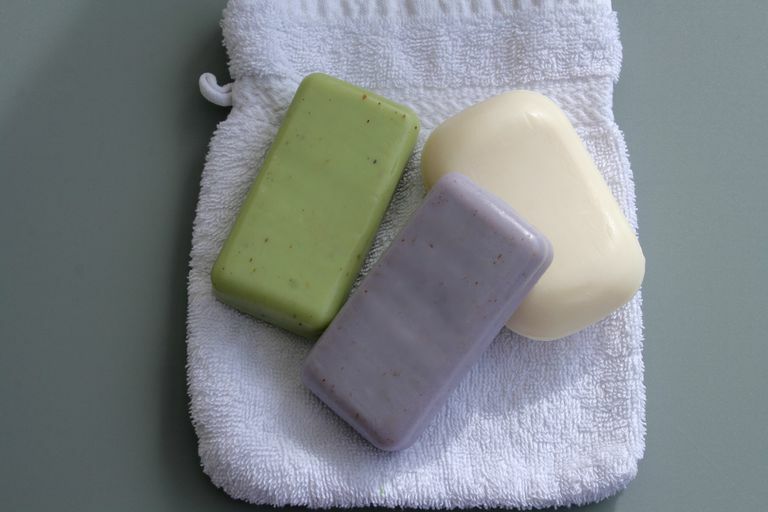 Although there are many true soaps that are all-natural, many soaps on the market today contain synthetic hardeners, fragrances, or colorants. This isn't good or bad, just something of which to be aware. if you're looking specifically for an all-natural bar, read the ingredients. Most bar soaps you buy at the store aren't technically soap at all; they're syndet bars. Syndet is a hybrid of the words "synthetic" and "detergent." Syndet bars are made from synthetic surfactants. These surfactants are made from oil, fats, or petroleum products which are processed in ways other than traditional saponification. Instead of alkali saponified animal fats and vegetable oils, syndet bars contain ingredients like sodium cocoyl isothionate, sulfosuccinates, sulfonates, and betaines. But simply because they are made with synthetic ingredients does not mean they are "bad" for your skin; in fact, quite the opposite. These soap-free cleansing bars can be quite gentle. Dove (the very first syndet bar launched), Cetaphil, and Eucerin bars are all good examples of gentle syndet bars. Although we as consumers call syndet bars soap, you will never see them marketed that way. To be considered soap, according to the U.S. Food and Drug Administration, the product must be mainly alkali salts of fatty acids. So, manufacturers can call syndets detergent bars, cleansing bars, or beauty bars, but never soap. Superfatted soaps are true soap bars that contain extra oil. The extra oil within these bars has not been saponified (hasn't turned into soap). The superfatting improves the soap's moisturizing abilities and makes it less irritating to the skin. Some people, though, find superfatted soaps to be too heavy and not cleansing enough. Transparent soaps can be true bar soaps or syndets, with the addition of glycerin for added moisturization. The added glycerin helps make them milder, but not always. The components of transparent soaps can still be irritating to the skin. It depends on the formulation and ingredients of the particular product. A transparent bar is not a guarantee of a mild soap. Combination bars are exactly what they sound like. They are a combination of different types of cleansers designed to maximize cleansing while minimizing dryness and irritation. These bars commonly combine ingredients of superfatted soap and syndet bars. Many bars on the market today are combination bars. Choosing the right bar for your skin can certainly feel overwhelming. But knowing what you are looking for will help narrow your choices. Decide what's most important to you. Are you committed to all-natural, vegan skin care products? Then a traditional handcrafted soap would be your preferred bar. (Just remember to read the ingredient list, not all handcrafted soap is all-natural or vegan.) Is it more important that the product be inexpensive product and easy to find at most stores? Syndet bars will be your go-to cleansers. Do you need a facial bar or a body soap? A bar with robust cleansing abilities may work great on your body. Use that same bar on your face, however, and it's likely to be too drying. As a general rule, you'll need a more moisturizing bar for the face than the body, so plan on getting two different bars. Can you use bar soap on your face? Absolutely, as long as it is gentle and non-irritating. Listen to your skin. It doesn't matter what type of bar you're using if it's leaving your skin feeling tight, dry, or itchy, it's not the right product for you. The right soap will leave your skin feeling clean and refreshed, but never stripped. And just because a bar works wonders for your friend, doesn't necessarily mean it's right for you. Everyone's skin is different and reacts differently to soaps and cleansers. If possible, try out samples of products before you purchase them. Really pay attention to how your skin feels, not just immediately after you're done washing but after using the product for several days or a few weeks. Ask your dermatologist for recommendations. Your dermatologist knows your skin and your particular situation, so will have some great suggestions for you. If you're seeing an esthetician, you can also ask for her/his advice with one caveat: estheticians typically recommend the products sold by their salon above all others. But getting a pro's take can be helpful if you're feeling overwhelmed with options. One type of bar soap isn't inherently better or worse than another. Some true soap bars are gentle and some are drying; some syndet bars are gentle and some are drying. Don't get too bogged down trying to identify what type of bar you're using (unless you're a bar soap connoisseur and you enjoy doing so.) If you like the way a soap bar makes your skin feel, you like the scent, and you like price, then it is a good bar for you. Takagi Y, Kaneda K, Miyaki M, Matsuo K, Kawada H, Hosokawa H. "The Long-term Use of Soap Does Not Affect the pH-maintenance Mechanism of Human Skin." Skin Research and Technology. 2015 May;21(2):144-8. U.S. Food and Drug Administration. "Soap: FAQs." U S Food and Drug Administration Home Page. U.S. Department of Health and Human Services, 21 Dec. 2016. Web. Wolf R, Parish LC. "Effect of Soaps and Detergents on Epidermal Barrier Function." Clinics in Dermatology. 2012 May-Jun;30(3):297-300. What Are the Best Facial Cleansers for Oily, Acne-Prone Skin? How Do You Choose the Best Face Wash? What Are the Best Products for Washing Your Face If You Have Dry Skin? Does Water Dry Out Your Skin?